1. Summary on the recent hardships and international solidarity activities. 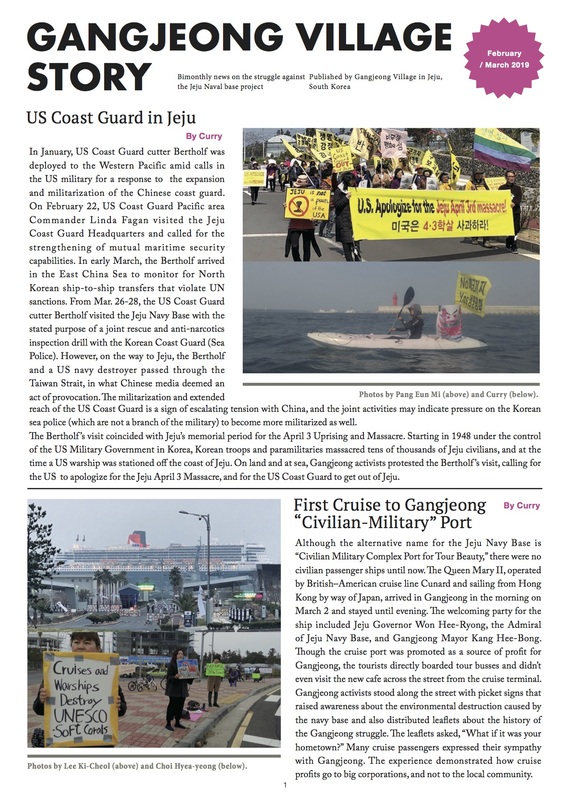 The recent joint war exercise by the ROK-US-Japan in the water areas of the east and south seas of Korea –including the water area between the east south of Jeju and Kyusu Islands, Japan on May 15 is with the mobilization of Aegis destroyers from three countries and US nuclear aircraft carrier that has brought students’ protest in Busan. The war exercise is suspected of the US Missile Defense system. Meanwhile, between May 7 and May 17, so many things happened in the village. Following the re-imprisonment of Park Suk- Jin who was directly arrested from the court for the charge of so called violation of bail conditions on May 7, Kim Jong-Il, co-representative of Seoul branch of Solidarity for Peace And Reunification of Korea (SPARK) was arrested directly from the Jeju Prosecutor’s Office and imprisoned on May 15. He was unjustly charged of unpaid fines of 450,000 won. It is his 2nd imprisonment in relation to the naval base issue. The total number of current prisoners is five including three before them. Further, as the Island government conducted murder-like crack-down of people’s sit-in tents(see here and here), even mobilizing some main land policemen, four people including mayor Kang Dong-Kyun, uncle Kim Jong-Hwan, a villager, and two activists of Mr. Lee Jong-Hwa and Koh Gwang-Sung were arrested. They were all released by now. The crack-down resulted in two villagers’ medical diagnosis or hospitalization. Kim Mi-Lyang, a woman villager was pushed off by the police elbow and fell from 6 m railing. Fortunately she is alive. But she had to get stitches in her belly. She is still in hospital. Uncle Jong-Hwan fell during the police investigation due to tension and stress during the crack-down. More details should come but you can see some photos of them here and video on police’s intentional pushing-her-off, here. On May 10 event, see Organizing Notes, here. The next day, Jang Sung-Shim, a Catholic follower and Jeju native was arrested when she protested illegal construction (destruction) of the naval base project and demanded the Island government and police’s official apology to Kim Mi-Lyang. She carried out self-injury by hurting her wrist with knife and the embarrassed policemen released her soon the next day (See the photo and video each). 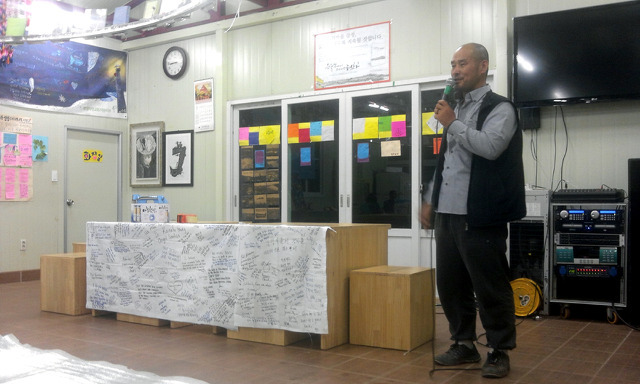 Still, inspiring solidarity activities have been done in Taiwan, Okinawa, and the United States. The details would come, too. Especially Jeong-Young-Hee, Chairwoman of Women Villagers’ Committee to Stop the Naval Base Project has been thankfully invited for the US speech trip for 20 days. We so thank you all the international friends who have shown constant care and support on the struggle. Chairman Go Gwon-Il congratulates the release of mayor Kang Dong-Kyun and Mr. Lee Jong-Hwa, as well as safe returning-back of Jeong Young-Hee, Chairwoman of Women Villagers’ Committee to Stop the Naval Base Project on May 12. Today is the day when Buddah came to this world , as well as the day that remembers the 6th year of foundation of the Villagers’ Committee to Stop the Naval Base Project. It has really been an exhausting and very hard time. Now, the Gangjeong village has become well known with its name in the nationwide and overseas. Even though the naval base is being driven with its changed and false name of so called civilian-military complex port for tour beauty, we are not losing yet. Unless we give up, the navy cannot progress to the stage of militarization of the village and Island as it wishes. Even though the navy has not given up its military residential housing project and is to extend its business such as to entry road and cruise terminal etc., it will be difficult for it to drive as it likes, if only the Gagjoeng villagers’ will is firm. Even though last six years have not been by our will, our own achievements have been that we have differentiated the direction of government, though small, braking its unilateral way. Isn’t it same with the thing that an ant, though cannot abruptly stop the steps of elephant, interrupts it not to properly walk or to change its direction by making it cover its own eyes or by tickling its ears? If there are many more ants, the elephant cannot but turn away. Now the struggle against the naval base has become the fight between justice and injustice, haves who attache to money & power and have-not-s who know to be happy despite small possessions and who live well without law, though the latter do not have power. The people in the world are watching us. They will be the judge of this struggle. The more judges, the more difficult is for the navy to win over us with its unfair acts. Jeong Young-Hee, chairwoman of the Village Women’s committee to Stop the Naval Base Project has traveled the United States and made public relation on the struggle. Most overseas Korean societies are supporting the Gangjeong village. She tells that many United States citizens are with us. It is only possible because we have fought for seven years overcoming the hardships of six years. The first start has been today, six years ago. We truly express our respect and gratitude to the initiators who courageously created the Villagers’ Committee to Stop the Naval Base Project at the time when it was wrongly presupposed that many would be in favor of naval base. 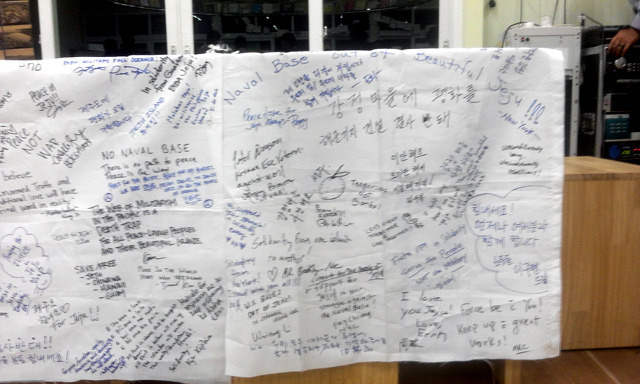 And thanks so much to the Gangjeong villagers who have courageously endured hardships and crisis. Please be with us in the future as well. 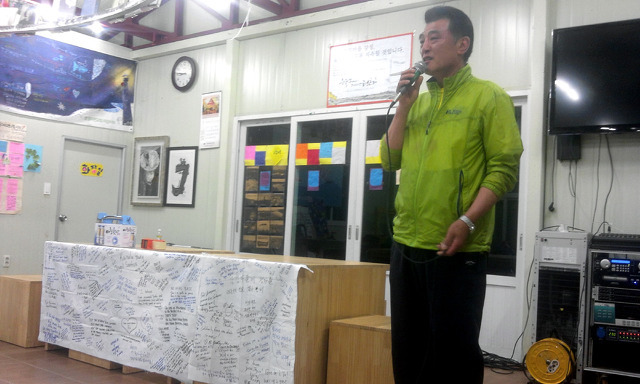 Chairman of the Gangjeong Villagers’ Committee to Stop the Naval Base Project. 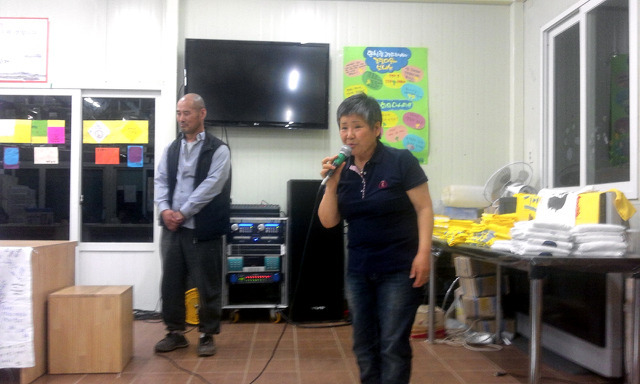 Jeong Young-Hee, Chairwoman of the Women Villagers’ Committee to Stop the Naval Base Project, Gangjeong Village, reports on her US trip on May 12. Mayor Kang Dong-Kyun, released two days later after his arrest on May 10, talks about unjust murder-like crack-down on people’s sit-in tents and police arrests of them on the day. He chained himself and was dangerously hung to chain during the police crack-down. On May 12, the court dismissed police application on the arrest warrant against him. 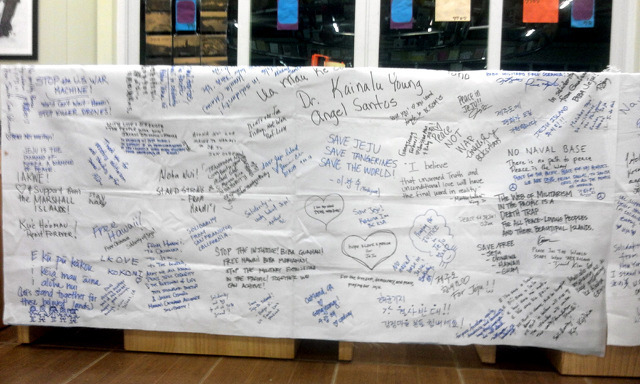 Solidarity messages from the friends in the United States. Jeong Young-Hee brought this from her about 20 days’ trip to the US that included Hawaii, Maine. Boston, New York, San Francisco, and Los Angeles. May 17 was also celebrated by the Christian youths. The video is a scene from the event program of Christian youths’ peace pilgrim visit to Gangjeong. “Peace Starts When We Cry Together.” The original title of the music is told to be “We gonna dance in the DMZ.” Some dancers include village chairwoman Jeong Young-Hee and Paco Booyah.